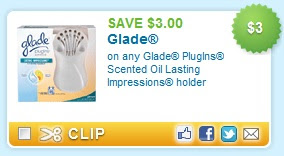 SAVE $3.00 off any Glade® PlugIns® Scented Oil Lasting Impressions® holder. Look under "Household", page one, no zip code chosen. You are allowed to print two per computer.